Home / In-Store Deals / Online Deals / Hobby Lobby® Christmas Trees | 7.5 & 9 ft. Pre-Lit Trees for $179.99! Hobby Lobby® Christmas Trees | 7.5 & 9 ft. Pre-Lit Trees for $179.99! I just had someone asking me about the best deals on Christmas Trees, and I came across some AMAZING prices on Hobby Lobby Christmas Trees where they have 40% off select Christmas Trees! You will see 40% off Hobby Lobby Coupons you can clip and use online or print and use in-store, but you can’t use it on Christmas Trees. All you have to do to get it click on the “40% off one item at regular price” at the top of the screen, and the coupon will clip for you and apply in your cart. You will see lots of great options in this Sale on Hobby Lobby Christmas Trees with small porch trees up to HUGE 9 ft. trees! I found this Slim Arizona Fir Pre-Lit 7.5 ft. Christmas Tree for $179.99 which is a great price for this size that is pre-lit! This NINE FOOT Ultra Slim Sheridan Spruce Pre-Lit Christmas Tree is also just $179.99, and I even saw it in stores at this price! Here is a great price! The 7 ft. Ultra Slim Bristol Cashmere Pre-Lit Christmas Tree is down to only $119.99! This is so snowy and pretty!!! The 7.5 ft Flocked Fast Shape Cashmere Sonoma Pre-Lit Christmas Tree is $299.99! Another great option is the 7.5 ft. Instant Light Fast Shape Royalton Pre-Lit Christmas Tree for $239.99. 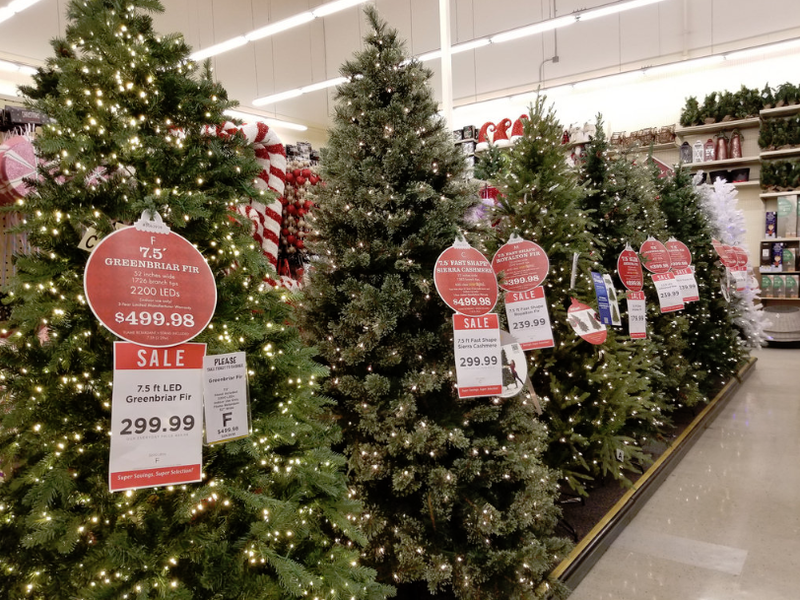 Check out all of the options of Hobby Lobby Christmas Trees On Sale today and get your new tree this year early! Hobby Lobby® is a trademark of Hobby Lobby. Ensueño® Max Fabric Softener only $0.67 at Target or Walmart! Tide Pods, Liquid, & Gain Flings® just $1.61 each at CVS!